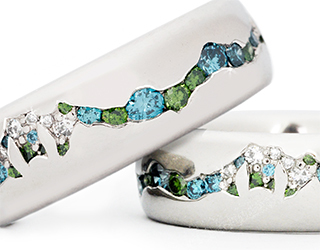 Palladium; White, sky blue and emerald colored diamonds. Erin and Shanna contacted me from Washington to ask if I would design wedding rings for them. It was such a pleasure to work on their project. One of their very favorite activities together is trail riding in the beautiful Pacific Northwest. Together we designed their 'Between the ears" rings, their horses ears picked out in palladium with the profile of spectacular Mount Baker in the background.